Mr Abbas Kazemi is the Public Relations Manager at Iranian Petrochemical Commercial Company (IPCC), and has recently been awarded the honor of being the best such manager in the Oil Ministry. Events- Mr Kazemi, we were very pleased to hear of your election as the best of all the public relations managers working in the Oil Ministry. This is quite an achievement. Would you like to tell us something about your work? Abbas Kazemi- I would first like to congratulate all your colleagues who work to produce Events, which is indeed a fine magazine. Everyone at IPCC is by now familiar with this publication and admires it a great deal. IPCC is the sole sale channel of Iran's petrochemical products and therefore the largest exporter of non-crude oil exports and hence Iran's second largest exporter next to the National Iranian Oil Co (NIOC). Yet IPCC is a subsidiary of National Iranian Petrochemical Company (NIPC), a vast organization that has made considerable progress in recent years under the management and leadership of Mr Nematzadeh, a capable and experienced manager who is well known in the management circles worldwide. 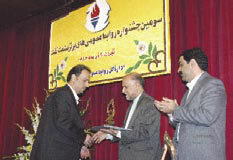 Mr Nematzadeh and Mr Ehtiati the Managing Director and Chairman of the Board of IPCC demand work of the highest caliber. They are hard working people who encourage others to work hard and up to the highest professional standards. The task of Public Relations in IPCC is very demanding and I owe my success to a large degree to my colleagues who, during the past two years, have truly assisted me. E- What is so demanding in your work? AK- Well, to begin with we have to work almost round the clock especially when we are holding conferences, seminars or forums or have foreign guests, or when we are participating in international conferences and other gatherings. It is up to the public relations personnel to make sure everything goes well and properly. We are the link that connects the company, particularly the Managing Director, to the outside world. It is our task, especially, to make sure that the image of the company is as good as the company itself and that, the company leaves a good impression. We are also in charge of publicity which includes a large volume of publications that aim to introduce the company to its counterparts, clients and the public. We have to act professionally and produce material that is up to the best of international standards. We, therefore, have to keep up-to-date at all times. And, believe me, all this means a lot of hard work.